Alan Moore and Kevin ONeill invite you, and some of the finest creators in comics, in to join them in a different kind of dark: Cinema Purgatorio! This ongoing monthly series will feature Alan and Kevin in every issue and is their first major new project together since League of Extraordinary Gentlemen! Anthology has become a dirty word, so far be it from us to clean it up. Instead well shine our light onto the cutting edge of sequential art, with black and white artwork to allow illustrators pure visions, and the greatest assembly of writing talent ever gathered on one series. Every issue is perfect-bound, with no ads, and all of the works are very long-form, there are no collections planned before 2018. Jump in now and embrace the new future of comics. The one of which Alan Moore has always dreamed. Its here, now. Hiding in the dark corner. 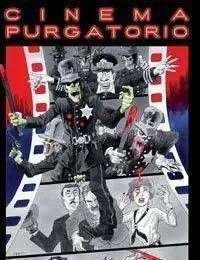 Welcome to Cinema Purgatorio.